a coalition of organizations opposed to genetically modified food in India has written to the minister of state for environment and forests seeking withdrawal of clearance given to Bt brinjal. The Coalition for GM-free India alleged the expert committee that cleared the genetically modified brinjal for commercial cultivation in the country was neither impartial nor thorough. The Expert Committee 2, set up by the Genetic Engineering Approval Committee (geac), the clearing house for all genetically modified crops in India, cleared Bt brinjal on October 14 (see Green signal for Bt brinjal, Down To Earth, November 1-15, 2009). Bt brinjal is now awaiting the nod of the environment minister, Jairam Ramesh, after which it will become the first GM food crop to be sold in Indian markets. The anti-GM coalition alleged the constitution of the expert committee and its terms of reference indicate it was set up to give a go-ahead to Bt brinjal. What gave grounds for the allegation is the fact that over a period of time a third of the committee members have been in some way associated with either the seed company Mahyco that developed Bt brinjal or pro-Mahyco organizations (see All Mahycos men). Selecting them for considering Mahycos application for commercialization of Bt brinjal raises the question of conflict of interest and violates the principle of fair inquiry, the coalition said. Chairperson of the expert committee, Arjula R Reddy, said the committee was there to review the data submitted to geac. It had no power to decide on tests to be conducted for clearing Bt brinjal, he added. A member of the committee, who did not want to be named, told Down To Earth that when the meeting was convened on October 14 the mandate was to clear the crop. He said a few members dominated the committee, while others had very little to say. P M Bhargava, the Supreme Court nominee to geac, had also written to the environment minister on October 20, saying the expert panel was under pressure to clear Bt brinjal. Bhargava wrote that Reddy had made a confidential call a couple of weeks before the October 14 meeting to tell him that he agreed with his recommendation for eight tests on Bt brinjal that were not done. Reddy is quoted as saying that even the tests that were done may not have been satisfactory and adequate. He (Reddy) was under tremendous pressure to clear Bt brinjal and he had calls from the agriculture minister, geac and the industry, wrote Bhargava, adding that Reddy perhaps succumbed to the pressure. Bhargava had disagreed with the expert committees decision. When Down To Earth spoke to Reddy, who is also vice-chancellor of Yogi Vemana University in Andhra Pradesh, he said he was under tremendous pressure but not in the way Bhargava understood. There was pressure because of the time that was being taken for reviewing the data. I had to collate all the analyses and that was taking time, said Reddy. Although he agreed Bhargava had recommended additional tests, Reddy reiterated that the Bt brinjal developer (Mahyco) had done all the tests recommended by the newly adopted guidelines for GM crops. There can be innumerable tests but they should have been recommended by the Review Committee of Genetic Manipulation (rcgm) in all these years (since 2000), said Reddy. rcgm is under the Department of Biotechnology and assesses applications for testing genetically modified crops before geac can consider their field trials. The new guidelines referred to by Reddy were prepared by the Indian Council of Medical Research (icmr) in 2008 and adopted by rcgm early this year. The anti-GM group smells foul play in this. The minutes of the geac meeting on May 28 last year state, icmr was in agreement with the views expressed by Bhargava on (testing) chronic toxicity, especially in GM foods, which are to be used for long periods by human beings. In the same meeting geac asked icmr to reconsider Bhargavas suggestion for dna fingerprinting, study of proteins (Bt brinjal contains a gene from a bacterium that produces a toxic protein that kills pests), study of possible interaction of the Bt protein with commonly used drugs and its effects on reproductive health when amending the guidelines. These recommendations were not accepted. For someone to agree to Bhargavas recommendations and then drop their inclusion (in the guidelines), there must be some strong reason, said Kavitha Kuruganti, member of the Kheti Virasat Mission, part of the anti-GM coalition. Even the earlier expert committee, which reviewed Bt brinjal before Expert Committee 2, had recommended independent studies of toxicity in laboratories accredited by the National Accredition Board for Testing and Calibration Laboratories. The anti-GM coalition claims the studies have not been done. The first expert committee also asked the National Institute of Nutrition in Hyderabad to suggest additional tests required for toxicity and allergenicity, and nutritional studies needed after examining the data presented by Mahyco. A right to information application filed by the coalition showed that the nutrition institutes director made comments based on only three studies by Mahyco oral toxicity, acute oral toxicity and allergenicity studies. 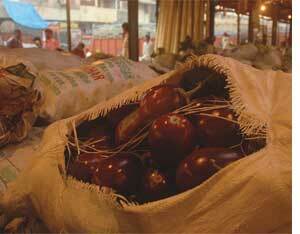 The director, however, noted that the laboratory that tested Mahycos brinjal did not authenticate whether the brinjal it received was genetically modified. Tests like toxicological impact, biosafety and environmental safety should be done by independent laboratories; geac should not rely on the data submitted by the developer, said P C Kesavan, distinguished fellow at M S Swaminathan Research Foundation in Chennai. This (clearance) is a hurried decision and it seems to be more commerce-driven than having a scientific base. The 16-member Expert Committee 2 was constituted on May 29 this year but it met only twice before clearing Bt brinjal for commercial cultivation. Of the 16 members 13 attended the first meeting and 12 attended the second. Dhir Singh and S B Dongre, who represented the Ministry of Health and Family Welfare, were present only in the second meeting and did not take part in the deliberations. So no questions regarding health were asked on behalf of the public. 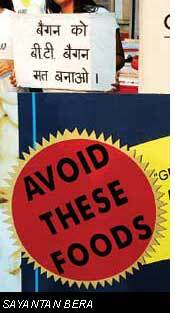 The two were from the Food Safety and Standards Authority of India. Kuruganti said the authority chairman told the anti-GM coalition that Singh and Dongre were present at the meeting only as observers. Lalitha Gowda, scientist at the Central Food Technological Research Institute in Mysore, and C M Gupta, former director of the Central Drug Research Institute in Lucknow, did not attend either of the meetings. Scientists are now suggesting the environment ministry organize public hearings with scientists and consumers in cities before taking a decision. They say genetic modification is not an immediate need; there are other methods like conventional breeding for tackling the pest problem. Ramesh has said he will decide after consulting scientists and civil society groups.